In appreciation for the flood of condolences and tributes to Consortiumnews.com founder Robert Parry, we publish a sampling here. Robert Parry’s family has been deeply touched by the flood of messages mourning his loss. As a father, grandfather, uncle, cousin, brother, husband, and yes, as a journalist, Bob touched so many lives and we will be processing and coming to terms with his loss for a long time to come. My apologies to those who have penned tributes that haven’t made it into this compilation. Intercept journalist Jon Schwarz has been a supporter and promoter of Bob’s work for many years. His blog A Tiny Revolution often included recommendations of Bob’s books and included links to Consortiumnews. At Alternet, former New Republic editor Jefferson Morley reflected on his impressions of Bob when they got to know each other in the mid-1980s. Another video at YouTube from the “Fault Lines” program delves into some of the unfair attacks that Bob has experienced in his career, including after his death. One of the hosts, Garland Nixon, reported that the anonymous smear merchants of the shadowy PropOrNot website continued to attack Bob after he passed away. “These people are slime,” Nixon correctly pointed out. 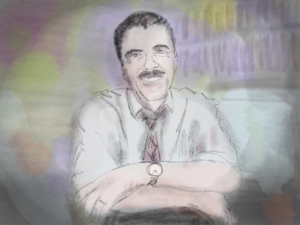 The Peter B. Collins radio show devoted half an hour to remembering Robert Parry’s work, discussing Bob’s passing with his friend Ray McGovern. “He was a really good example to me of someone who doggedly pursued the truth and suffered the marginalization. They made him a pariah. They called him a Putin puppet,” McGovern said. I appeared on Dennis Bernstein’s “Flashpoints” radio program Monday along with journalist John Pilger, which you can listen to here. Pilger expressed appreciation for Bob’s steadfast commitment to evidence-based journalism and pushing back against assertions and fact-free claims promoted by the mainstream media, whether related to Russiagate or the Syrian civil war. “What Bob Parry did most effectively was to produce the evidence,” Pilger said. 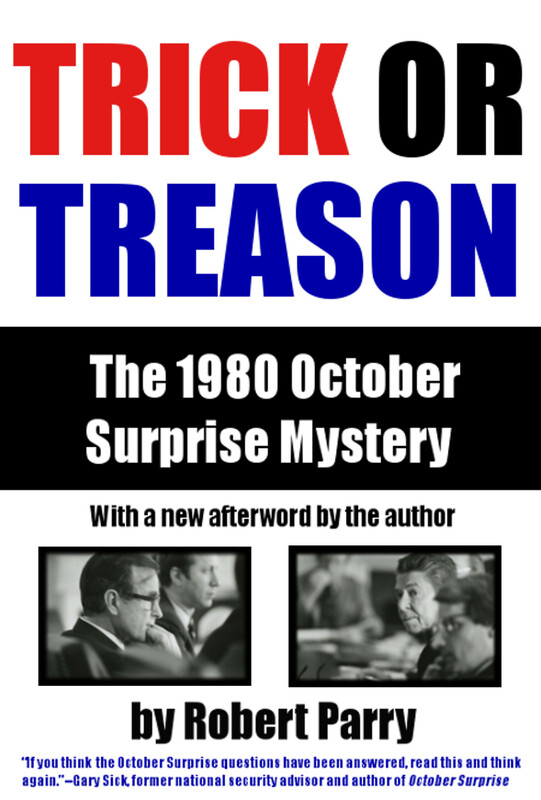 Michael Tracey, it turns out, was only partly right, as some mainstream outlets, including the Washington Post and New York Times – papers that Bob had often criticized for promoting propaganda and “groupthink” – published grudgingly respectful obituaries. “In 1995, frustrated with what he saw as dwindling venues for serious investigative reporting, Mr. Parry founded the Consortium for Independent Journalism,” wrote the Post. Bob Parry was a journalist. For decades I considered reading Robert Parry’s articles and books a fundamental requirement of being an informed, effective American citizen. The loss of his unparalleled perspective deeply hurts the intelligent assessment of our Country. Lisa Pease and I devoted about an hour and forty minutes to eulogizing Bob Parry at Black Op Radio on Thursday night. The thing is, we could have gone on even longer because we still could not summarize all of his major reporting achievements. But I think we did get across some of the insurmountable perseverance Bob had in the pursuit of honest and uncompromising journalism. I really hope this site survives, that would be a wonderful complement to Bob’s extraordinary career. “It was so sad to learn of the premature death of Robert Parry, the great American journalist with a true intelligence in the best sense of this word. 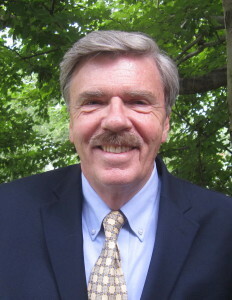 Robert Parry became well known and respected in the Soviet Union after his investigation of the Iran-contra operations conducted by the CIA. Recently, he attracted attention in Russia because of his independent and fearless position with regard to the tragic events in Ukraine and his investigation of the Malaysian Boeing catastrophe in July 2014. Robert Parry was a true journalist, whose opinion was very important for many Russian people. He struggled for truth in a world of lies and hypocrisy and he sacrificed his life for truth. Essential listening. Long but many RPM (revelations per minute). Probably the best interview with Robert ever. I have never met Mr Perry but I have read his work voraciously. He has been an inspiration to me as I can relate to his sickness of “truth-telling.” He will be missed. A nice tribute To Robert at link below. Mr. Parry was gracious enough to give Lew Rockwell, my friend and mentor, permission to reprint his wonderful writing on Lew’s site. I’ve followed and supported this site for years and truly will miss a great, courageous man. My thoughts and prayers are with his friends and family; his legacy endures and the good that he has done, his fight for truth and peace is immortal. The best was to honour Robert Parry, Gary Webb, and all the other brave reporters current and past, is to expose the names of those who would (and do) manipulate what news we are fed and deny us the RIGHT to know the truth, deny us the RIGHT to seek the truth and expose lies. This blatant attack on our RIGHT to KNOW is the downfall of democracy and the USA. There is so much we need to know and time is running out to take back our freedom and right to seek the truth. It is essential that we do. “Don’t mourn, re-organize. Pummel the PropOrNot bastards. Read and support Consortium News and the other intellectually-honest alternative media, and create one, two, many more like them. Even rightwing media recognizes Robert Parry’s greatness. “Note that though Parry’s writings show him to have been a man of centre-left views he worked impartially and objectively, confirming or refuting stories irrespective of whether they harmed or benefited Republicans or Democrats. “Possibly the cruelest blow of all was to have his own site Consortium News included in a preposterous list of supposed Kremlin controlled websites cobbled together by the anonymous group PropOrNot which was then disgracefully published by the Washington Post, one of the newspapers which has now published Parry’s obituary (The Duran was also on the list). Huh? ? The Duran is not “rightwing media”!!! No thanks to Parry for all the friends I’ve lost when citing what he had written about Ukraine, Syria and Russia. (“Oh, so every major newspaper and TV news show is wrong and your guy, Parry, is right? Give me a break!”) BTW, I checked the NYT obit and they cited a number of Parry’s stories but their chronology stopped at Ukraine and left off Syria and Russia. I was actually surprised they included Ukraine but they did it in a half-assed way. “Mr. Parry was featured in “Ukraine on Fire,” a recent documentary film that argued that the 2014 uprising in Ukraine, which some Western news media depicted as a people’s revolution, was actually a coup staged by nationalist groups with the complicity of the United States.” (NOOOooo!) Anyway, now that Mr. Parry is gone I might get back some of my friends but it looks like this Caitlin Johnstone won’t be doing my social life any favors. RIP Mr. Parry. Today (Feb 1) on his Flashpoints radio “news magazine”, Dennis J. Bernstein replayed an old interview of his with Robert Parry and Gary Webb. Click the link below to access the show on KPFA’s archives. Yes indeed. We’ve got to put the magnifying glass on the CIA once and for all, i.e., draw the line at Mr. Parry’s death. A good marker, for sure. On one other note, the article that Mr. Parry wrote in March 1995 (precedes the start-up of Consortiumnews ?) for Fair.org entitled “The Rise of the Right-Wing Media Machine” is one of the most righteous summaries of its period, 1970-1995. Just awesome. That is very much a classy memorial at the end of this thread, and I will assume it will follow all threads and articles. IN MEMORIAM with his picture. What a guy. ‘Nuff said. I am so glad that so many are showing respect for the late Mr. Parry. When Mr. Parry passed I did a search to see others that were honouring his passing but this search also uncovered the disgusting comments from PropOrNot which demonstrated how truly disgusting and immature these people really are. I would think that Mr. Parry’s most ardent critic would at least have enough respect to say nothing upon his passing but PropOrNot just proved how truly classless they are. It worse that disgusting and immature, it’s evil IMO. They’ve shown their true colours, and we know them for what they are. Me, too. May his journey be blissful. and his spirit for truth be sprinkled upon all nations of the world. all creatures. great and small. When I learned he died, I wept. Each time I have read mention of his passing — now, too — I have found myself weeping. This moment, I am weeping still. 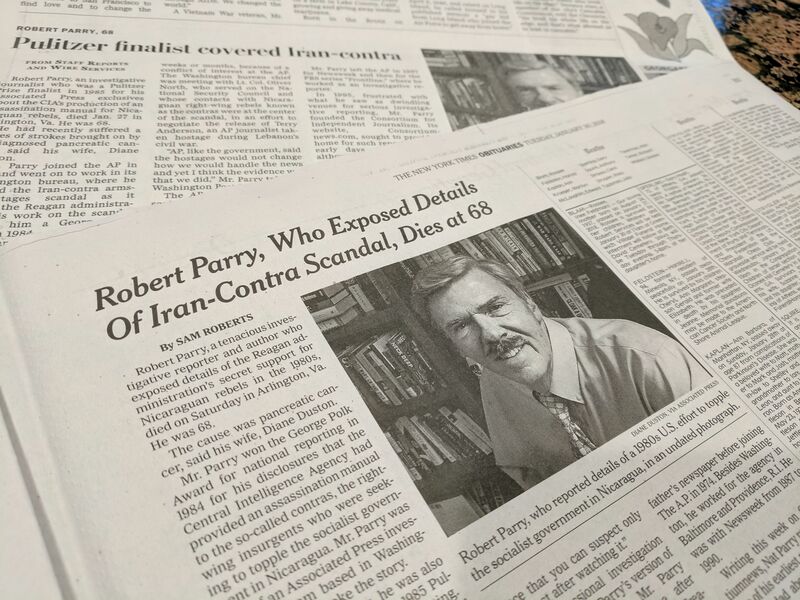 Robert Parry was an investigative journalist of uncompromising integrity and passion. His many articles and books will no doubt be a treasure trove of independent investigative journalism for future historians ad scholars. His ability to cut through the BS which is a hallmark (unfortunately) of our corporate controlled “free press” and provide fresh insight based upon research and hard work provided decades of readers with an alternative narrative which attracted many to his website including people who were also alarmed by the main stream “official” take on events. 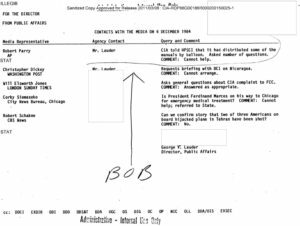 Bob had an ability to sift through the morass of information and find the truth behind all of the official lies gobbled up and regurgitated by major news outlets. 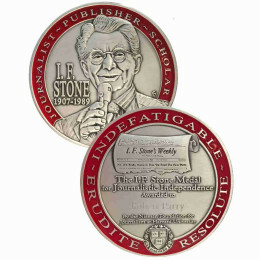 No wonder that the NY Times and the Washington Post could hardly muster any praise for his work. Who cares about the main stream press or their jabs at the reporting of Robert Parry. One has only to examine his carefully detailed and fact supported analysis to see why they would find his many articles wanting. No doubt they found him to be a distraction and counter voice in the propaganda wars they were waging. Robert Parry never got us involved in foreign wars but pointed out the inconsistencies in the group think which led to wars. He was the counter punch and the truth teller who told us all about the truth behind the false narratives being generated out of the Washington Press and the “commercial news machines” that were controlled by the Washington establishment. Today we need more fact finding and insightful investigative journalists who speak the truth more than ever. But it is a hard road filled with roadblocks and potholes now more than ever before. Our national media outlets have doubled down on reporting misinformation, distracting entertainment pieces, biased reporting and self serving “benefits me” corporate spin. The total effort by our national main stream media to filter, block. divert, conceal, obfuscate, confuse, spin, lie, twist and fall silent on matters critical to the citizens of America who require an informed citizenry to make correct informed opinions are doing their best to undermine our democratic society by supplying disinformation, spin, propaganda and control over what they report on. The situation is critical. Our national media is lying to us 24/7 and American Citizens are coming to false conclusions based on the massive efforts to turn public opinion into a force for electing the wrong politicians to represent us all. It will not end well without a counter punch to counter the spin and propaganda. Therefore it is critically important that this website goes on to counter the massive influence of a propaganda press which hails the theft of our future and despises all who dissent. I just discovered Robert Parry’s website last year so it’s a shock that he is gone so soon. When Trump became president and the liberals lost their brains, I’ve depended on Consortium News for real reporting. I wish more Americans knew how important Robert’s work had been and what we’ve lost with his passing. Over the last five years or so, there have been three major intellectual-commentator truth tellers who have passed on: Alexander Cockburn, Gore Vidal, and now Robert Parry. Sad times, but their spirits will live on for eternity. Thanks for this, Nat. I’m still reeling from the loss of your father, both to the nation and to those of us who turned to him as a touchstone for the type of integrity and courage that could save us, were it more widespread. Caitlin Johnstone’s meditation on his life has been the most comforting for me so far. There have been additional respectful articles and mentions of Mr. Parry’s passing at websites once considered liberal or progressive but which have fallen, along with so many others, into the cheap and easy practice of blaming everything on Russia and/or Trump. Observing these hypocritical gestures toward the honest journalism of Robert Parry has been a bit like watching the sanctimony of the Corleone family at funerals. I hope you and Consortiumnews’ longtime contributors, and courageous new writers, can keep this site going as a place we all can turn to for thorough and conscientious reporting. I think Mr. Parry was wise to maintain restraint in responding to the inevitable attacks and fabrications of a very disreputable establishment and its craven minions. Those who denigrate this or any site for “relying on reader contributions” should consider the lengths to which the DNC had to resort in defeating a primary candidate whose $27 individual donations gave their corporate-loaded candidate a run for her mega-bucks. With regard to the incomparable Robert Parry, we may be getting close to the time when we will turn from the devastation of loss to the gratitude we feel for all he managed to do, and to the hope and courage that his example engenders in us. I find the stab at public financed journalism by The Post stunning. They’re the ones that sold out to their corporate masters, well Bezos these days, as if that’s a bad thing. I get the Post’s headlines and they have no integrity what-so-ever, whatever they may have had in the 70’s is gone entirely. All the best sources these days are crowd funded affairs. Sure no one is going to be able to afford a McMansion but why would anybody want one in the first place? Robert’s fearless journalism is a high water mark few will ever attain. The honesty that Mr. Parry provided with his books and this website (joined with the opinions of others) was fresh, pulled no punches. His work will live on and he will be missed by many. As a long time reader of Robert Parry, I join all those who hope that Consortiumnews will be able to continue to enlighten us in the years to come. As a person who lives in France, let me point out that the excellent site les-crises.fr has reprinted in translation many articles of Robert and his colleagues and certainly plans to continue to do so. Also let me refer to https://www.counterpunch.org/2018/02/01/honoring-robert-parry/ in Counterpunch which stresses his many contributions to informing us all about what is going on around us. I am still reeling from the loss of Robert Parry from my daily news intake. He was like a compass that always pointed to true north. I know that there are other independent journalists out there, but none with the same clarity of thought and expression. Surely there will be a Robert Parry Award soon bestowed upon worthy journalists who follow in his footsteps, doggedly pursuing the truth in the face of the ubiquitous organised resistance by the establishment. Robert’s passing away is mot depressing for free journalism though i had individual differences with him on occasion. Dislike bringing up the obvious question of why he died, but it reminds me of what happened to me and my pancreas about at the same age, It was when I was attacking the CIA and the Clinton administration from Portugal when I started getting cyclical seizures because of poisoning of my food at a restaurant in Caldas da Rainha. I survived because i moved to Sweden where he process stopped, and ultimately my pancreas recovered because of my strong cardio-vascular system. Did the Agency filnally settle scores with poor Robert? I believe that lovely drawing was done by Caitlin Johnstone as well, she’s also an artist. Thank you for pointing that out. The caption is corrected now. Here’s a tribute I found on counterpunch. May the Parry Family find comfort with the outpouring of sympathy, and sadness of Bob’s passing, as they travel through this time of grief. Personally I feel complete that I discovered Mr Parry’s genius when I did, because Bob made me a more informed person, and with that I appreciate all that he had done for me, whether he knew me or not. I was surprised Chris Hedges seemingly had nothing to say about Robert Parry’s passing. Thought they’d be natural allies. I ought to have felt surprised by your being surprised. Hedges is a sick politico, not a journalist. Nè anche io – me neither. Haven’t heard a word out of him. Disappointing. How terrible to rely on contributions! Much better to serve the powerful to get their Ad revenues, and then kowtow to their demands as to what gets published and what does not. 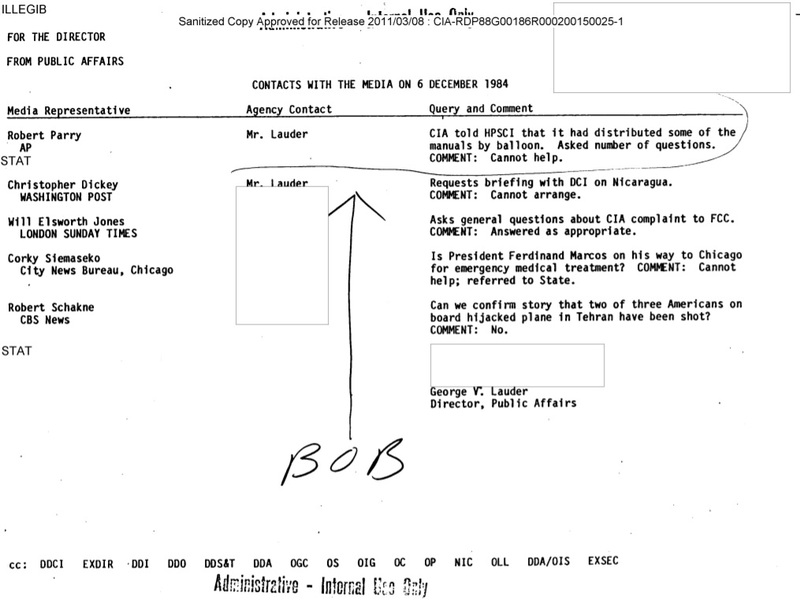 And of course it is much more comfortable to be on a first name basis with your controllers at the CIA. Easy for the Post to say now, given the takeover by Bezos. I didn’t see them announce the cancellation of their own subscription business model. Yeah Skip, any thing supported by the people’s contributions must be nefarious at best, NOT! Yes, Skip, it reminds me of comments the late, great comedian Bill Hicks said when speaking of the advertising industry. “You are the scum of the earth, go kill yourselves, no, really, I mean it, kill yourselves.” For anyone who had the pleasure and honor to see Bill Hicks perform live, they will know what I speak of… Bill was blacklisted in this country and adored in Britain. Even Letterman later apologized for nixing Bill’s appearance once. Hicks also died of pancreatic cancer, at the tender age of 32, I believe. Check him out if you haven’t heard of him. As for Parry, I miss him terribly and have been having my own Parry-fest the last few days. Brilliant man, indeed. Yeah, better to be supported by the Bezos and indirectly the CIA, like the Post. Robert’s passing feels to me like a cynical twist in nature’s justice system: Robert personified honesty, sincerity, transparency, straightforwardness, a plain decent man, whose life was taken prematurely, while the scum of the earth, war criminals like Kissinger, Cheney, George H.W. Bush, and so many others are allowed to live to a ripe old age. I know that this statement probably cannot be backed up statistically but I find the irony striking. That’s the first thing I thought when we were told of Mr. Parry’s death. Life really can be unfair, and I think most of us have experienced that in the loss of a loved one. Pancreatic cancer, most often a silent killer, and Mr. Parry was anything but silent, and thank God, for that.